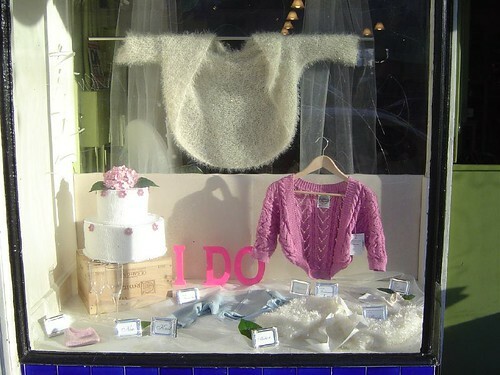 I finally got the wedding window up at Noe Knit yesterday. It was super cute when i was carrying the cake to the store this little boy stopped me & asked if it was a real cake. The little silver frames are actually placecards I found at Joannes, I’m using them as little signs that say things like For The Bride or For The Bridesmaid. I still have to add the white openweave shrug I’ve been knitting & need to seam plus one last bag. Now I have to figure out what to change the other window to. 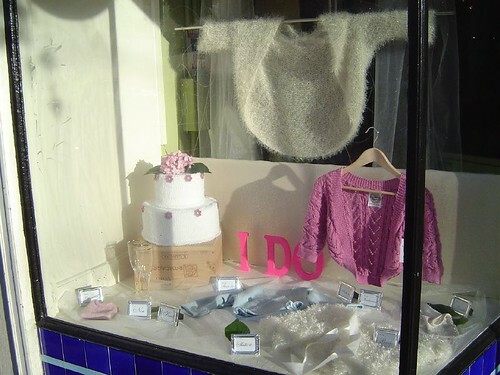 Baby Shower would be pretty easy but would it be too cutesy to have a wedding & a baby shower window up at the same time? 13 years ago by Kat in Easter , Knitting , Needlecraft | You can follow any responses to this entry through the RSS feed. You can leave a response, or trackback from your own site. Summer fun – knitted bikinis and coverups? Beach balls as props? Back to school – knitted sweater and backpack for the fall? I love the glittery shrug you’ve got hanging in the window… Is it from a free pattern? Looks very light and airy! This whole display makes me want to renew my vows… pretty. Just read the comments and little devilworks already suggested my idea. A beach scene. Bikinis, coverups and beach bags. And sun hats! It could be really fun! The wedding window turned out awesome! It must have been so fun to do. I love the white shrug! you know I have been planning a Summer window but was going to wait until July…maybe I’ll have to push it up. I have a ton of ideas but I need to knit for them! I’ll have to find out what pattern the shrug is. It was a sample the store had & I didn’t check the tag, silly me. another thought—how about a travel/honeymoon/vacation window? You could do beach stuff (hat, bikini) kntting themed books (to read on the plane or at the beach), easy, take along project ideas (socks, simple shawls) and you could put a few of these into one of those knitted mesh market bags. Use maps, or photo’s as a background and voi’la..you have a window. Hey, I thought Matthew was making some people for the top of the cake?! Did he not get them done in time? I DO think that the window looks fabulous! awesome work, kat! Love the window! But that cake is just too much…What a creative talent you are!